You are here: Home / Photobooth Articles / How Does Scrapbooking Work? Scrapbooking is a common question asked by couples. Preserving memories though photographs has been growing in popularity since the invention of the camera. All homes have picture frames, and the newest way of organizing your pictures is through a memory book. This is a great way of keeping your pictures in an album along with stickers and other theme related decorations. Any event that has a photobooth can greatly benefit from having a scrap book created. There are numerous stores dedicated to memory supplies. These stores stock everything needed to create your book. Since they carry various colors and designs, they will have the right paper to fit your theme. The scrapbooks themselves are also available in unique patterns to compliment your event. Stickers, gel pens, and die-cuts can also be purchased to decorate each page. Putting wedding scrapbooks together though can be quite a task. Renting a photobooth can alleviate this burden. Not only will your guest have loads of fun taking pictures in the booth, but a few companies will offer the scrap booking service at no cost. Reputable photo booths include double prints. This means one strip goes in your scrapbook while your guests take the other half home as a keepsake. Some photobooth companies charge extra for the service. 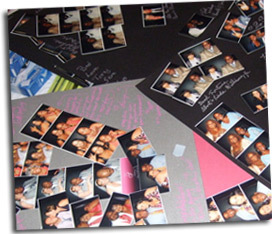 Having your scrapbook being assembled at your event allows guests to leave personal messages next to their photo. The text written by the pictures are one of the most thoughtful benefits of scrap booking. Looking back at your memory book in the years to come can help you reflect on great times. You can even identify who the people are that wrote the message. If you have any more questions on how scrapbooking works, then feel free to contact us.